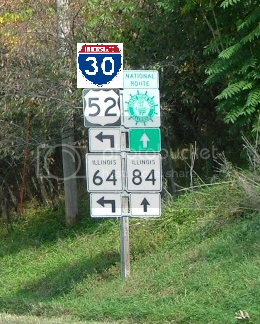 US 67 northeats of Little Rock is future Interstate 30. This is the first time I've clicked on this thread....really no idea why I even did this time. I'd just like to say, NE2, thank you for using my picture. Would provide a good route from Dallas to KC. I know, old topic, but it's one I'm interested in. AHTD has been building US 67-167 piecemeal since the 1960s. It got to Cabot in 1970 (I remember seeing that date etched in the back of an old shield that was still up about 10 years ago), to the south end of Searcy in the mid-70s, and by 1984 it was extended north of Bald Knob but not quite to Bradford. I haven't been on that freeway since 1999, but I think it ended at AR 14 in Newport at the time. Gov. Beebe's hometown is Searcy, which explains his keen interest in seeing the project through (at the expense of other more-needed projects, sadly) and giving it an I-30 designation. But I think AASHTO will take the numbering matter out of his hands. Whether MoDOT builds a freeway to St. Louis or does the logical (that is, cheaper) thing and upgrades US 60 from Poplar Bluff to Sikeston, it's primarily a north-south freeway either way. The pay-as-you-go way AHTD funds projects is silly. It's like building a house by going to Home Depot and buying two studs and a shingle at a time. If you build a house that way, eventually the exposed lumber will deteriorate. Over time you're left with tackling both building projects and degrading infrastructure at the same time, and 67-167 encapsulates all of it (witness the stretch through Jacksonville). AHTD claims it's a lack of funding. A similar problem has plagued the Fayetteville US 71 Bypass. It was built as 2-Lanes with at-grade intersections (except US 62), and slowly upgraded when the road was deemed too dangerous. First, it was flashing warning lights at all intersections. Then select intersections were upgraded to interchanges (and 4-Laned less than half a mile in either direction). It was done very piecemeal and when they finally finished upgrading everything, they decided to build the Springdale-Rogers Bypass . It was built in stages, but was built as 4-Lanes from the beginning. The more I think about it, the more I think it's Arkansas as a whole, not just AHTD. Cities grow and governments seem to be at a loss at how to compensate, so they pave everything. I can offer one pro for doing it as "pay as you go." If you wait until you have the money to do all of the project, then you will need more money for that project due to inflation. Also, if you do a big stretch of road at once, then resurfacing and maintenance will probably have to occur around the same time, which will be a larger one-time jump in spending. 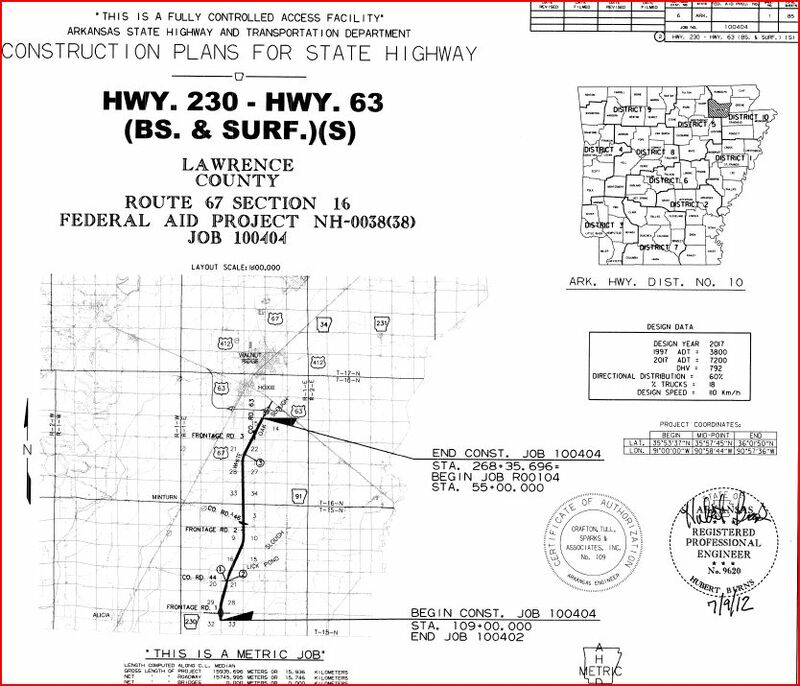 On March 20, FHWA approved AHTD's amendment to its 2010-13 STIP to allow for two base and surfacing contracts from Highway 226 to Highway 230 and from Highway 230 to US 63 in FY 2012. Total estimated cost for the two projects is $56 million. It may be possible to drive on this new section of the extension in 2015, indeed. AHTD awarded a contract for this project on May 4 for a little over $12.2 million (page 5/8 of pdf). THE PURPOSE OF THIS PROJECT IS TO CONSTRUCT THE PAVEMENT FOR 15.746 KM (9.902 MILES) OF HWY. 67 IN LAWRENCE COUNTY. THIS PROJECT CONSISTS OF AGGREGATE BASE COURSE, PCC PAVEMENT, ACHM SURFACE COURSE, RUMBLE STRIPS, EROSION CONTROL ITEMS, PAVEMENT MARKINGS AND MISC. ITEMS. I wonder if AHTD will seek an interstate designation once the US 67 freeway is completed from I-30 to US 63? Interesting also how all the specs are metric. 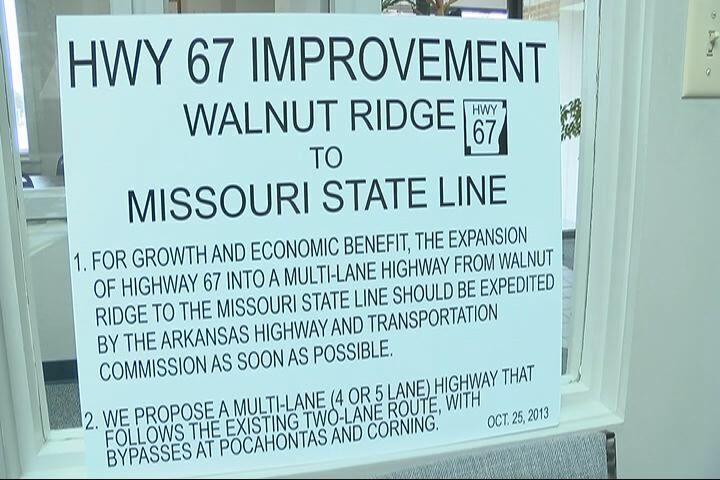 WALNUT RIDGE, AR (KAIT) - After almost three years of going back and forth with having to agree on a new hwy 67 route to the Missouri state line, a compromise has been made. The New route will use most of the existing highway 67 and create a bypass around Pocahontas on the east side, and a stretch of road that will lead to a bypass around Corning on the west side. "We expect announcements over the next year of multiple industrial developments along this route," said Walnut Ridge Mayor Don House. With new developments in the work comes anticipated heavy traffic. House said taking care of it now is important before it becomes a problem in the future. "With all those plans in mind, we're trying to get ready for that," said House. "Some companies have already made some big investments in properties along this line." Although, it took nearly three years to come up with a compromise from all the cities along highway 67, the new proposed route is much affordable and timely than what was originally discussed. "We're building only 37 miles instead of 57 miles, and we're building it from Pocahontas to the Missouri state line," said House. "We're following the existing route except for minor adjustments and the bypasses around Corning and around Pocahontas." House said there's a lot more to this new proposal than just accommodating the amount of drivers who will be traveling on the highway. "It's for safety, environmental impact, economic development and industrial growth," said House. There's not a lot of money for the project now, but House said a new highway bill could fund the project much sooner than anticipated If it's approved. "There are ways at which we may be able to begin the building of this project through some influence on the bill." House said they are waiting for approval signatures from Searcy city officials, and plan to send the proposal to Governor Beebe and the Highway Commission to approve. Members of the Highway 67 Coalition met in Walnut Ridge, Ark., where a compromise was announced on the final location of that last 50-mile stretch needed to make a four-lane Highway 67 corridor a reality. Interestingly, MoDOT's Butler County Route 67 Project will be a four-lane Route 67 shifted to the east of the existing alignment with limited access from the existing four-lane south of Poplar Bluff to a mile south of the Route 160/158 intersection. This seems to be in sync with AHTD's new terrain US 67 east of current US 67. Maybe MoDOT's long-term plans do call for a new terrain freeway US 67 from the MO/AR state line to Poplar Bluff. Anyone know when the new alignment of US 67 southwest of Poplar Bluff was completed? No, I was there in 2007. Based on what I'm seeing in Street View, I'm thinking the new 67 might not have opened until maybe 2013...? Just looking for the correct year. If you're referring to the section near US 160, it was still under construction in early 2014. Yes, that's the segment. Apparently opened March 31, 2014... thanks!